In my review for the recent Outer Spaces tape, I talked a bit about the city of Baltimore’s music scene. 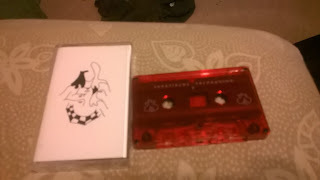 Well another fantastic Baltimore act has issued a fantastic tape. In other news the grass is green, the sky is blue, and the whole world is covered in Monsanto™ chemicals. Sunatirene is the name Sydney Spann uses to create art. While she and Outer Spaces are both from Baltimore, the similarities stop there. Her music is the type a long list of genre buzzwords like ‘experimental electronic-acoustic lo-fi folk with field recordings’ could be mashed together in a futile attempt to describe. There are so many different things going on over the course of this tape and it’s impossible to pin down any specific part of it as the best part. Spann gives listeners a journey through sound; taking them to many excellent places that don’t necessarily seem like they would be possible to put together that she proves are. Going from a nice and simple acoustic place, only to be washed over by a wave of complex electronic production, then to have well selected samples of both field recordings and other audio sources lead through until they fade out, replaced by Spann’s own beautiful singing, then introducing string arrangements, and finding a way to get it all to work in perfect harmony. By the end of the tape, listeners will have heard a lot between the starting the building electronic chaos on “The Modern Dracula” to when the disembodied voice on “Stay Safe Sister” finishes. But like any good trip, it’s an experience well worth having.